The DSG3000 Series offers standard AM/FM/ØM analog modulation, as well as options for I/Q modulation and I/Q baseband output. The DSG3060 has a maximum frequency of 6 GHz. Featuring a high signal purity with phase noise measuring <-110dBc/Hz@20kHz (typical) and a wide output range of -130dBm to +25dBm, the DSG3000 RF signal generator has standard pulse modulation with an on/off ratio of up to 80dB, with optional pulse train generator available. The DSG3000 series also has an amplitude accuracy of <0.5dB (typical). High Power Output up to +25 dBm Simplifies high power setups. No external amplifier needed. Advanced Modulations Engineers can generate more complex signals without additional hardware using the modulation schemes in the DSG3000. Advanced modulations including internal IQ and Pulse train are options, while AM, FM, øM, and pulse modulations are standard on the DSG3000 Series instruments. IQ Modulation Provides both internal and external IQ modulation capabilities. Accepts User Defined I/Q data. Minimizes workbench footprint while maximizing functionality. Different forms of IQ Modulation are utilized in many of the more advanced RF specifications including WiFi. The DSG3000 can be used to emulate IQ data using either the internal baseband generator or external inputs. 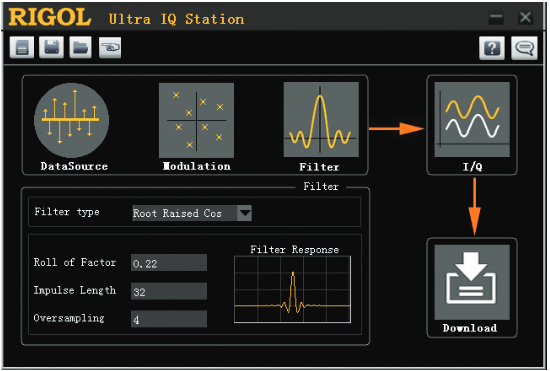 IQ Station software is the free PC interface for loading and modulating data into the baseband IQ generator. Power Sensor Readback Option Simplifies test setup. The user can directly read data from popular RF power sensors via a simple USB connection. To utilize the power sensor readback capability make sure to add the PMC-DSG3000 option to the order. This option can be added to an instrument at any time. High Accuracy timebase option Your source is only as good as your reference. Stable and accurate clock provides basis for high performance RF output. 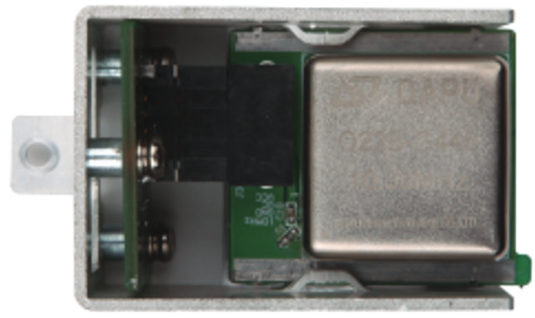 The Model OCXO-A08 option is a hardware module that inserts into the DSG3000 Series generator. It can be purchased at any time and improves clock stability to 5 ppb. Rack Mount kit for DSG3000 Signal Generators. May be different than image. Rack kits are different for each instrument. With similar performance capabilities and advance modulation capabilities along with a >8% price performance advantage the Rigol DSG3000 series Signal Generator provides an outstanding value for customers wishing to reduce their overall cost of test.